No, seriously…what? What even happened in the last half hour of this finale? It felt like a freshman English paper where someone stated a plethora of themes at the beginning, got to the end, and then realized they hadn’t addressed any of those themes in the conclusion, so they just crammed them all into the final paragraph, sense be damned. 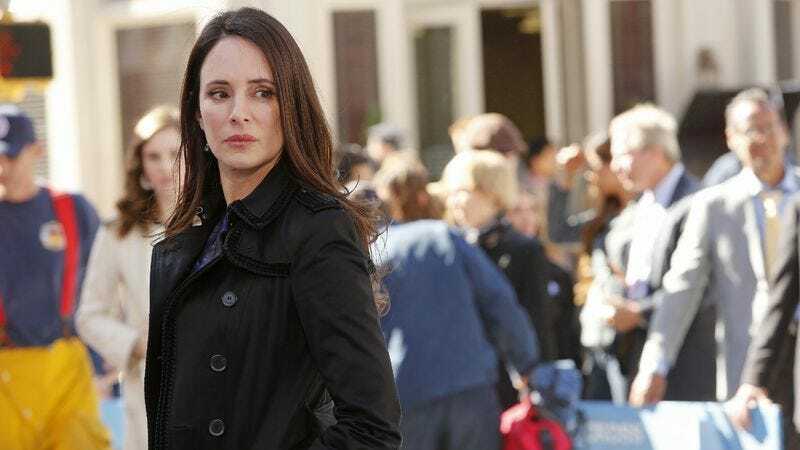 Revenge introduced a lot of random things throughout this very messy season two—Padma, the Falcon, the Initiative’s true goals—and then sort of crammed them all together here and desperately hoped it all made sense. Unfortunately, it did not. The first hour of the episode was solid enough, dealing with the immediate aftermath of the blackout, Conrad’s gubernatorial campaign, and Jack’s vendetta against Conrad, but the entire first hour was all about setting the scene for the Initiative’s big plot. That plot? To blow up Grayson Global. No seriously…what? Why did the Initiative blow up Grayson Global? Why did they cause the blackout? What did they accomplish from any of this? The big reveal of the entire situation wasn’t that the Initiative blew up Grayson Global, it was that Conrad was in on the entire plan from the beginning, via a deal he made with Helen Crowley to gain access to the inner circle. This little tidbit certainly makes sense for Conrad’s character—he would take any opportunity to gain an upper hand, no matter the consequences—but I’m not sure it makes sense at all for the actual plot. The one thing Conrad’s involvement with the Initiative does set in motion is the tragedy of the episode, Declan’s death. When Conrad learned Jack was conspiring against him (due to a little tip from Victoria), he handles it the way any self-respecting man would: He sends Jack to a building right before he knows it is going to blow up in an attempt to murder him. But while Emily and Nolan are able to warn Jack in time to get out, somehow Declan ends up there instead. How? I have no idea! Because although he gets one decent scene each with Jack and Charlotte, Declan as a character isn’t important at all; his only purpose is to die so that Jack can get to that balcony at the end, gun in his hand, ready to kill Conrad as he gives his victory speech. The most frustrating thing about this whole situation is there were so many nice moments in service of something so ultimately meaningless. Nick Wechsler was saddled with the most annoying, passive story this show has ever done in the first half of the season, but Amanda’s death brought the character back to life again and his performance has been up to the task at every moment. He gets some wonderful and fun moments tonight—most notably squaring off with Victoria and grieving his brother’s death—but ultimately, all of his machinations tonight were pointless. Jack was never going to pull that trigger. Conrad, having revealed himself as complicit with the Initiative, is now the biggest, most tangible villain the show has, and there’s no way someone like Jack will be the one to take him down. No, Conrad’s eventual demise will definitely be at the hands of Emily Thorne. Or should we start calling her Amanda Clarke? In the one interesting, risky moment of the episode, Emily finally does what she should have done ages ago: She reveals her true identity to Jack. It’s the best decision the show made in the finale, the one thing that will have interesting consequences for next season, and the one thing that promises to actually give the show some much needed forward momentum. Jack was simply getting too close to the truth to not be in the know, and I look forward to how this will change the relationship dynamics of the show. Will Jack reject Emily or join her cause against the Graysons? Nolan and Aiden’s plots, however, were just plain confusing. Aiden’s arrest made sense, as he was framed by the Initiative to take the fall for everything, but his release and Nolan’s subsequent arrest was far too convoluted to track. So the Falcon implicated Nolan as the mastermind, which was corroborated by a suddenly-alive Padma? Who blamed him for everything and named him and him alone as the Initiative? Putting Nolan in danger and giving Emily a problem to solve next season is a fine impulse, but everything about his arrest and questioning was far too abstract to follow. As for Aiden, his fate is far more in question as he spent his last moments of the finale tangling with Daniel, who eyes a gun and then later shows up to Conrad’s victory speech with blood on his sleeve. Did Daniel kill Aiden? Who knows! This would be far more interesting if anyone cared what actually happened to Aiden. At this point, Daniel’s obvious love of Emily and his obvious manipulation by his father makes him the tragic character, not Aiden. So thus ends season two, a season full of promise that quickly devolved into an overcomplicated slog of shadowy cabals, unclear motives, and very, very little actual revenge. Other than a few bright spots, it is easy to see why ABC thought they needed a change next season. They have one great idea to springboard their season with (Emily revealing her true identity to Jack) and a whole lot of messes to clean up (everything else). It was tough to see such a fun, promising show devolve so steadily and thoroughly after a great first season, but if there’s one bright spot of this mess of a finale it’s this: At least the show has nowhere to go but up. Conrad setting up the press conference near the bombing so he could swoop in and get photo ops for his team as “first responders” was kind of delightfully despicable. Carl was with his grandmother. Um, what grandmother? Jack has no mom. Does he mean Amanda’s mom? Amanda’s mom who was apparently okay with her changing her name and dying and stuff? Amanda’s mom who we never saw? WHAT IS EVEN GOING ON HERE? The entire “Regina is obsessed with Charlotte” plot was terrible and unnecessary. She didn’t even get a chance to go full psycho and try to kill Declan! What a waste. So Takeda’s secret was that he had a fiancé on Flight 197, and Emily’s revenge plot was also his own. Am I missing why this is so awful? Self-interest isn’t inherently evil. “I think you’ll make a fine governor.” “You think I’ll make a fine resident of Albany.” Man, Victoria and Conrad are so deliciously evil to each other.